Looking to put your older home into the 21st century? 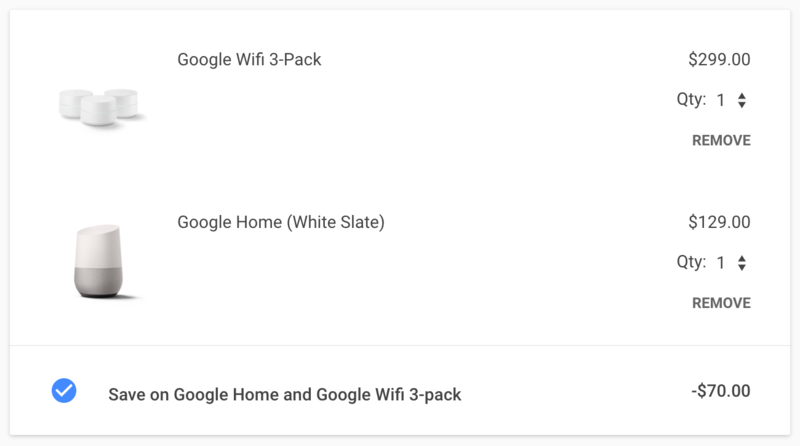 The Google Store has just the deal for you - while supplies last, you can pick up a Google Wifi 3-pack and a Google Home for just $358 total, a full $70 off their normal prices. By now, we all know about the ins and outs of both Google products. The Wifi is a mesh Wi-Fi system that expands your Wi-Fi coverage via small white pucks, and it's one of the best systems in its class. The Home, on the other hand, is a smart speaker with Google Assistant on board that can do such things as answer questions, set times, play music, etc. The duo is a truly nice combo to have around the house. The Wifi 3-pack is currently discounted by $35 to $264 on its own, but you can save a total of $70 with both the three Wifis and the Home. The offer is valid for as long as supplies are available, and you'll see the discount when you add both items to your cart. It also can't be combined with any other offers. Head over to the Google Store if you'd like to pick this bundle up. Target actually has the same bundle and same $70 discount, but it doesn't remove the Wifi's $35 discount when both are combined like Google does. That makes the price an even more palatable $329.99 before tax. Thanks, TypoCorrecto Target's links have been added to the source.